It is no secret that many within the healthcare simulation industry are confused about the need for (and, the process of) obtaining official accreditation for their simulation training centers. While there is a general consensus that accreditation has much value in recognizing an institution’s compliance with standards of excellence, there is also some misinformation regarding what those standards are, whether a simulation center meets essential criteria, how to begin the accreditation process, and where to turn for reliable answers. To answer these pertinent questions, we consulted Diane Mathe, MSN, RN, CHSE and CAE Healthcare Academy Group Leader/Tailored Solutions. Here, she speaks to the need for accreditation with cogent and professional insight. Ques: What is “accreditation” and why is it important for a healthcare simulation-based training center? Mathe: Competition is fierce among simulation centers seeking to acquire sought-after instructors, recruit learners, and obtain revenue from external sources. Accreditation benefits a simulation center by creating value in how it is perceived. Accreditation defines the expertise of a simulation center. By taking a rigorous approach to quality assurance and verifying procedural compliance, the accrediting body can guarantee that a center is either currently meeting standards of excellence, or that there is a quality improvement plan in place. Ques: What are some of the critical challenges institutions face in the accreditation process? 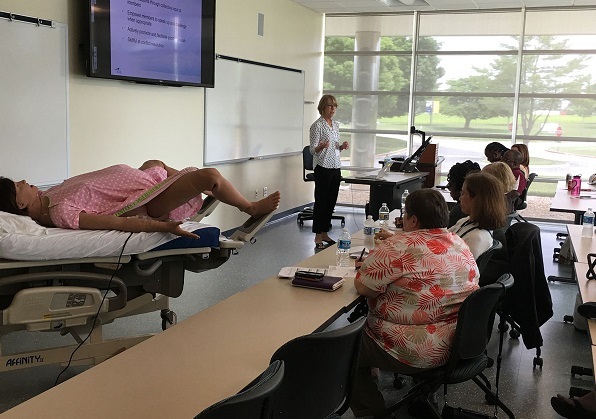 Mathe: I’ve served as a nurse in the United States Navy Nurse Corps, have taught in nursing degree programs, and have facilitated numerous simulation training scenarios using high-fidelity simulators and patient manikins. It’s been my experience that there is a pressing need for a formalized process of documentation, evaluation, and comprehensive review of the qualifications and training required of all faculty and staff within simulation programs. Standards of accreditation are vital in this regard. However, the accreditation application process can be lengthy, exhausting and time-consuming. This poses yet another challenge to institutions, and lack of accreditation can be detrimental in many ways. These are just some of the reasons why the CAE Healthcare Academy has developed its new Simulation Accreditation Consulting Program. Ques: What makes CAE Healthcare uniquely positioned to offer such a program? Mathe: The CAE Healthcare Academy is a team forged from experts in healthcare simulation and training. We’re subject matter experts, adjunct faculty, and full-time educators with broad histories and experience in simulation center operations, management, and the accreditation application process. Ques: Can you share more about the Simulation Accreditation Consulting Program? As the worldwide simulation and training partner of choice, we at CAE Healthcare are dedicated to ensuring simulation training centers meet their goals in being recognized for accreditation. Could your simulation center benefit from CAE Healthcare’s Simulation Accreditation Consulting Program? Let CAE Healthcare’s Academy of healthcare simulation and education experts assist your simulation center with a customized evaluation, a thorough assessment of processes and outcomes, and the help you need throughout the accreditation application process, and beyond. Begin Your Journey to Simulation Accreditation Here.